TOUGHPHALT SUPER RV is polymer modified asphalt that is used in recycling porous asphalt paving. 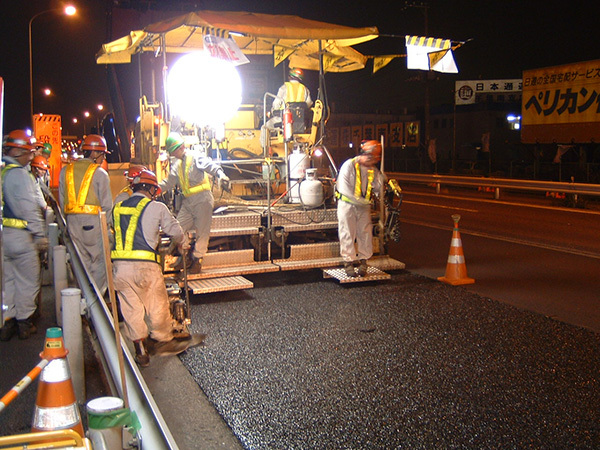 It uses recycled materials from porous asphalt paving (high function paving), and is used when re-utilizing these as a porous asphalt mixture. Recovers from the old asphalt’s low penetration rate to realize similar properties and conditions as new porous asphalt mixture that use the general polymer modified asphalt type H.
The recycled aggregate can be mixed at 30-50%, realizing a high recycling ability. An aggregate scattering resistance is realized similar to that of a new mixture using porous asphalt type H.